Time to sell your Sabine condo? Read about today's resort-market buyer. Pensacola Beach’s Sabine Yacht & Racquet Club is an ideal getaway for boaters and beach-goers. One of the few developments with boating facilities on site, Sabine Y & R Club is nestled between Little Sabine Bay and the Gulf of Mexico. 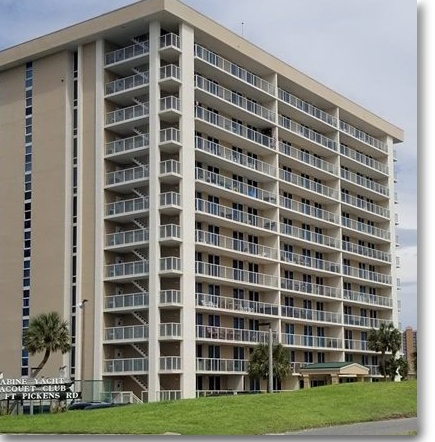 The 13-story complex holds one-, two-, and three-bedroom units, all of which enjoy spacious private balconies looking out over either the Gulf of Mexico or Little Sabine Bay. Walk right outside to Sabine’s private dock to hop in your boat and spend the day sailing around or walk just across the street to spend the day playing in the soft white sands of Pensacola Beach. The outdoor pool looks out over the Bay and is surrounded by a beautiful sundeck. Next to the pool are two tennis courts, perfect for an afternoon competition between friends or family. Sabine Y & R sits right on the bike path and near a trolley stop. Either hop on the trolley to get from one end of the area to the other or get on your bike and enjoy a relaxing ride with spectacular views of the water. Sabine Yacht & Racquet Club is just minutes from some of the best restaurants in the area. A four-minute drive brings you to the beautiful Pensacola Beach Boardwalk. Lined with fresh seafood restaurants and boutiques, you can easily spend the day walking up and down the board walk or digging your feet into the sand while you enjoy a cold drink. Just seven minutes away you’ll find the Fuji Steakhouse & Sushi Bar and Rotolo’s Pizzeria. Enjoy the natural beauty of Pensacola Beach and head over to Gulf Islands National Shoreline. With large stretches of undeveloped beaches, you can spend the day walking along the nature trails. Fort Pickens camping grounds are fifteen minutes away, the perfect area to build a fire and cook s’mores under the stars with the whole family. While you’re at the campgrounds, head over to Fort Pickens itself and take a tour of the historical fort originally built to defend Pensacola Harbor. Sabine Yacht & Racquet Club is an ideal choice for both resident and visiting boaters and their families staying in beautiful Pensacola Beach.